This is always the question that a do-it-yourselfer asks themselves before taking on a home renovation project. Normally, DIY projects are reserved for simple tasks that would save money, time and trouble. There are some renovation projects that someone with even a little bit of experience and an internet connection can manage to do on their own. But is a DIY tile removal project one of them? The short answer is no, and here’s why. You wouldn’t think so, but removing floor tile is actually an incredibly difficult and insanely time-consuming process. The major issues, though, are the ones you don’t know about until the project actually starts. Depending on the construction of your home, the tile could be attached to anything from cement to mason board underlayment. So, what exactly does this mean? It means that whatever is beneath the surface will determine how long the project will take and how hard the tiles are to remove. You’re not just popping tiles out and setting them aside to reveal a smooth, ready-for-renovations floor underneath. Floor tile removal involves a lot of chiseling, breaking, hauling, dusting, and aching— plus the added risk of damaging both the underlayment and the subfloor. There’s no easy DIY tile removal process, and there’s no one way of removing tile. If your floor is concrete, removing tiles requires literally knocking them up and breaking up the adhesive with hammers and chisels. Without experience or the right tools for the job, you can easily hurt yourself or damage your floor trying the DIY method. When the underlayment is removed with the tiles, you’ll need to either pry out or hammer in any exposed nails you come across. Failing to do so not only makes later installation challenging but is also a huge working hazard. Hopefully, you’ll have found any exposed nails by looking for them instead of stepping on them. If you don’t know what you’re doing, you might jeopardize the integrity of your floor by missing a big issue. For example, treating rotten wood or replacing divots in the concrete is necessary to keep the foundation smooth and even when the new flooring gets installed. An inexperienced DIYer might miss this and end up laying a new floor over an unsafe foundation. When all is said and done, there’s always going to be a huge mess to clean up. The room is going to be filled with broken tiles and coated with hearty amounts of dust. 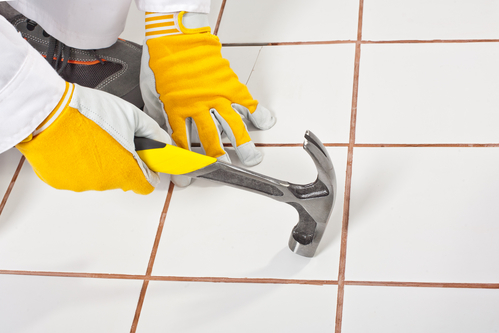 Clean-up time will be about the same— if not more— than the actual removal tile process. Everything listed above would be too much for even the most determined DIYers, but one major part of floor tile renovation projects that most people fail to take into account is the actual removal of the ripped-up tiles from the premises. Transporting the remains of what used to be your tile is just as time-consuming as the process of breaking them up. Despite what you might think going into the project, the garbage collectors aren’t going to take the broken tiles away for you. The remnants of most home renovation projects require a special kind of removal that can’t be covered by just hauling it to the dump. Remember, landfill dumping costs are based on weight, and that’s an extra expense for the DIYers. The main reason anyone attempts DIY tile removal in the first place is to cut back on renovation costs, but this is counterintuitive for a number of reasons. As previously stated, the DIYer is going to need access to certain things for a successful DIY tile removal, like the tools for removing the tile, the tools for the cleanup, and the means of taking the ripped-up tile to a proper disposal site. This, coupled with the likelihood of needing professional help anyway to fix your inevitable mistakes, makes DIY tile removal more trouble than it’s worth. You’re better off using a professional tile removal service. You’ll save time, money, and a whole lot of aches and pains. Tile removal takes time, hard work and a certain amount of expertise that keeps the project on track without risking damage or costly do-overs. At Dustbusters, our renovation specialists can handle your floor tile removal, cleanup, and disposal for you, all with minimal dust and mess. If you have any questions about our process or what to expect, give us a call at 866-883-8783.